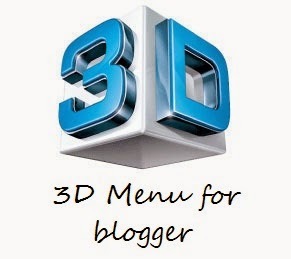 101Helper blogger menus, how to add 3D menu in blogger, Unique blogger menus, Menus for blogger, 3D vertical menu for blogger, 3D vertical menu for blogger, 101Helper blogger menus tutorials. In my recent post I have shared floating vertical menu for blogger and before that I have shared many type of menus which are stylish, useful, responsive and easy to use. All blogger menus are shared to help those blogger who don't know how to add a menu in blogger as blogger doesn't provide any option to add a menu directly so blogger have to add menu from other sites, so here almost any kind of can be found and added to blog by following step by step tutorial. After sharing different menus I am going to share a new, unique, responsive and neat menu. Make sure to add gadget just below title of your blog otherwise it will show up in vertical form. You can customize everything in this menu if you have knowledge about CSS, I will show you only some common customization in this menu such as color of text before and after hovering with mouse and also buttons color before and after hovering with mouse. All you have to do is to replace the codes with desired color code. You can get code of a color by reading this post. I have highlighted different pieces in the code above to make difference between hover and active mode. To customize this menu read below, if you wish to customize something else you can ask me in comments or contact me. This( background: #3db2e1;) represents the active color of the buttons, active color is that color which is displayed before hovering with mouse you can change it by replacing #3db2e1 with desired color code. background: #3db2e1; represents hover color, it is the color which is shown when a tab/button is hovered with mouse. color: #ffffff; is the color of text before hovering with mouse and color: #dff2fa; shows the color of text shown when a tab is hovered by mouse. Similarly to remove a button remove its code. For example to remove new button you have to remove <li><a href="#" data-title="new button">new button</a></li> from above code. Always remember to type name of the tab 2 time otherwise it will not show name of button when it is hovered by mouse. Example is shown above. To add a link to any button replace #(hash) with link. Step 1: Go to blogger dashboard and click on layout in the menu on left side. Follow the horizontal menu customization to add link to tabs, new tab or remove an existing tab/button. To change color of menu replace code of color in above piece of code which is highlighted with yellow color( background-color: #fafafa;). If you have any question ask me in comments or contact me. Follow and subscribe to get latest updates. Share this post with others and help 101Helper grow. Search tags: 101Helper blogger menus, how to add 3D menu in blogger, Unique blogger menus, Menus for blogger, 3D vertical menu for blogger, 3D vertical menu for blogger, 101Helper blogger menus tutorials.